This 84 mile round trip takes you past a list of impressive extremes. Starting near the highest mountain in Britain, Ben Nevis, it visits Britain's most westerly mainland railway station, Arisaig; passes close by the deepest freshwater loch in Britain, Loch Morar and the shortest river in Scotland, River Morar, finally arriving next to the deepest seawater loch in Europe, Loch Nevis! "The greatest railway journey in the world." A Magnificent Journey by rail, starting at the West Coast and finishing in Scarborough on the East coast. Passing a list of impressive vistas across Lancashire, Yorkshire Dales and West & North Yorkshire. Our Vintage carriages date back to the 1920's all carefully restored. Some featured in the Harry Potter Movies. At York we pick up one of the oldest working steam trains in the world 'The Scarborough Spa Express'. We complete our journey to the beautiful spa town of Scarborough. BOARDING SOON! - BOOK NOW! aboard one of our next railtours journeys. Join us for a nostalgic day to remember, to Stratford-upon-Avon, home of William Shakespeare. the home of William Shakespeare. From the comfort of your seat in some of the oldest working carriages in operation today, your adventure begins! Some of these carriages date back to the 1920s and served throughout the golden age of rail, and some featured in the Harry Potter movies, and have all been lovingly restored. These traditional carriages will be hauled by diesel for the first part of the journey, then from Hellifield/Carnforth the steam engine pulls the train across the Settle to Carlisle, England's most scenic railway. 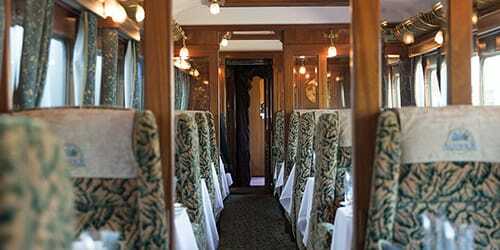 Evoking the opulence of 1930´s rail travel. 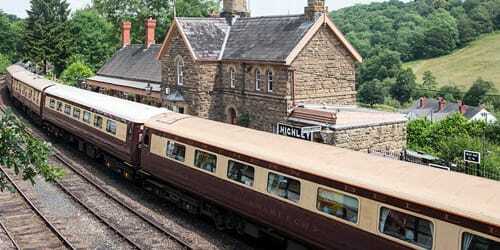 Our Pullman Dining train traverses the glorious countryside en-route to some of Britain´s top destinations. A unique dining experience on Britain´s finest Pullman train in beautifully decorated carriages, perfect for special celebrations. Experience the epitome of rail travel with these fantastic journeys of a lifetime in the ultimate style and glamour of the Northern Belle carriages. Travel to Britain´s most famous sporting and social events, unadulterated grandeur aboard Britain´s finest, luxury vintage train. An indulgent journey with gastronomic cuisine ensures you arrive fresh and energised. Discover colourful gardens and awe-inspiring fortifications. Travel in style and visit some of Britain´s most spectacular destinations that have been awarded World Heritage Status. Arrive at your destination refreshed and replete, ready to discover the delights of these Great British towns and cities. With exquisitely decorated carriages, sumptuous cuisine and liveried stewards each journey is as exciting as its destination. our green and pleasant land. What a grand day out. In the company of friends, Cleethorpes to Edinburgh return, travelled in luxury. Food was first class. The Catering team never stopped all day with service and friendly conversation. By the end of our journey many folks in our carriage were impressed, happy and all talking about where we could go next. Highly recommend it. 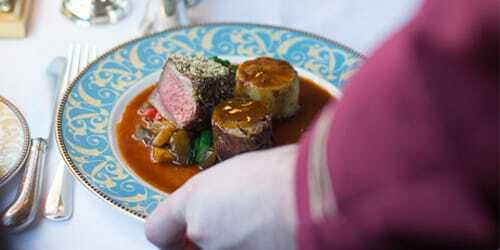 We did the Premier dining trip Settle to Carlisle and weren't disappointed. Excellent food and service. Lots of room and very comfortable. Fully relaxing journey with spectacular scenery. Highly recommended. Very enjoyable rail tour. All staff were always helpful, friendly and professional. The train manager kept everyone fully informed throughout our journey. The route passed though some spectacular scenery best viewed from the train. Dave Collier "Jacobite like you've never seen before!" CRRES is one of only a very small number of UK companies able to offer an extensive restoration service.